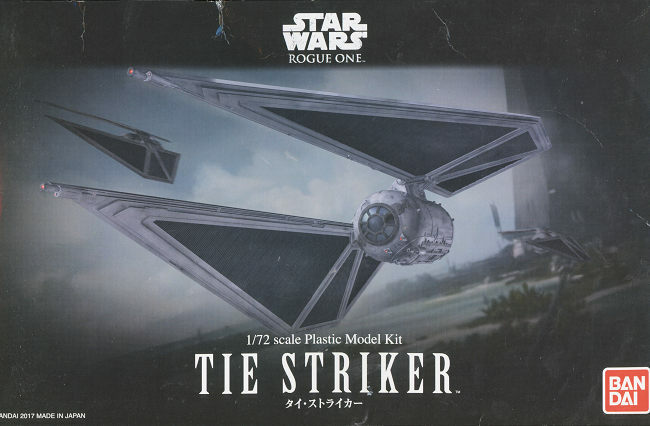 The TIE striker features flat, pointed wings which are specially designed for in-atmosphere combat. The starfighter is also useful for shifting supplies and personnel from orbit to the planet surface, thanks to a larger central pod. Though designed for atmosphere, it could also function in space and accompany traditional TIE Fighters. Equipped with advanced high-speed wings, it is faster than the standard TIE and has an extra pair of laser barrels. The attached proton bomb launcher is effective against vehicle units, dealing heavy damage over a large area. The TIE striker is able to gain speed by curling down its flat wings, engaging from flight mode to attack mode. BanDai's Star Wars kits are widely hailed by modelers as not only being accurate to the prototypes but also very well engineered and fairly easy to build. Indeed, they are basically snap kits that require little more than cleaning up of the parts to make the model. These kits are molded in a variety of colors to enhance that experience. This particular kit is mostly grey with black for the stand and inner parts of the 'wings'. It also includes a somewhat fluorescent green sprue for the lazer bolts. 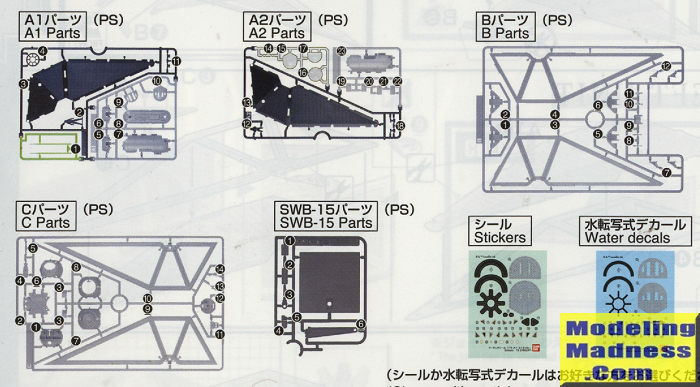 At least one sprue is a combination of black, grey and clear parts, a feature I've only seen with BanDai kits. Something I found interesting is a note that 'bubbles may be present in clear parts from manufacturing'. This tells me you won't be getting replacements. Many of the attachment parts are quite large and experience tells me that one really needs to add some glue to these to help the parts join all the way as they can be quite tight. The cockpit includes a pilot to help fill the void. Most of the decals (or stickers if you go that route) are for the cockpit. If you choose not to use the clear window parts, colored plastic bits are provided as replacements. It appears that one could paint the fuselage pod prior to attaching the clear pieces. The right and left wing panels are sandwiched in between the framework pieces that hold them. It does not appear that the wings can be moved and so one is left with them canted down somewhat. One is then left with building the display base and deciding if the laser bolts are to be attached to the fuselage or wing lasers. Instructions are excellent and constantly have you checking to make sure you haven't missed something. The painting guide is basically to ensure that you have the decals in the right place. As mentioned, most of these are for the interior. 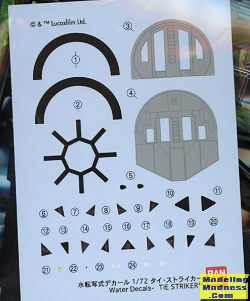 The interior itself should be a darker grey than the outside of the craft and BanDai recommends Neutral Grey. The outside greys are a lighter shade by 30% with the solar panels being black. So there you have it. Another very nice BanDai Star Wars kit. I should mention that the SRP in Japan is 2700 yen so the place in the US that sold this was marking things up a bit. Various Star Wars related web sites. Thanks to my friend Kevin for providing me with this kit.